We’re married artists Briana Feola and Jason Snyder and Brainstorm is our collaboration. A creative side hustle while “looking for real jobs", we knew that we ultimately wanted to make a living by selling our ideas and products. We consciously designed a life to align with those ambitions. For the past eleven years we have been navigating through successful creative projects and big failures, productively bickering the entire time. It was (and is) the result of being incredibly stubborn and building our careers alongside developing our core values as a couple. By always checking in with each other and keeping those values in mind things have lined up in beautiful, symmetrical ways. Merging our life and work allows us to follow good energy wherever it leads. We’re always evaluating how “big” we actually want Brainstorm to be. Staying small and nimble has always been the best option for home life and career, but that process has not been easy. It’s challenging to strive for simplicity in a world that screams MORE. In pursuit of the small but mighty, we’ve learned some difficult lessons and have come to appreciate failures as a crucial part of the process. There’s also a ton of friction in the way we communicate, but it’s a rhythm and style that helps us solve creative problems. Enormous pressure can create beautiful things. 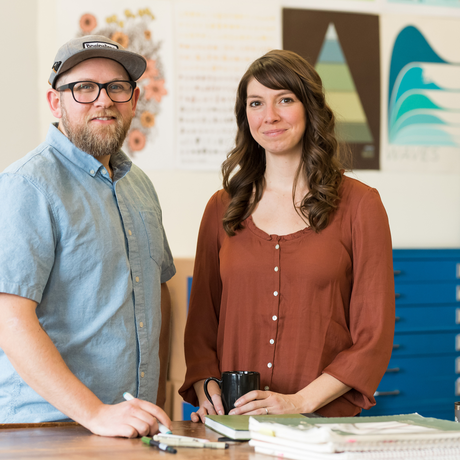 Right now, Brainstorm is a design studio and retail print shop. We make and sell screenprinted posters and illustrated products. We also work with clients to design prints, maps, murals, etc. We are excited to see how things line up this year.